NJPW G1 Climax 2018 weekly roundup week 4 – AiPT! The biggest G1 Climax in history is over. Where do we go from here? This final article on New Japan’s G1 Climax 28 looks at the 16th to 19th shows: the last four shows of the G1. Show 16 took place in a typhoon struck Yokohama while the last three shows were held in Budokan Hall in Tokyo. The previous G1 round ups can be found HERE, HERE and HERE. We’ll start with some match recommendations before finishing with a summary of the G1 and the current status quo in New Japan. Juice Robinson has had some great performances so far in the G1, but most of them have seen him play the underdog. While this wasn’t the case against Kenny Omega, I felt that it wasn’t a good showing for either of them. Leave it to G1 28 MVP Tomohiro Ishii to give Juice a great match where he wasn’t the underdog. Here we had Juice standing toe to toe with Ishii in terms of chops and physicality, which made Juice feel much more legitimate while providing a great, entertaining match. This battle between Los Igobernables Des Japon teammates had a lot of tension. SANADA originally tried to join New Japan in the same tryout class as Naito. While Naito was accepted, SANADA was rejected and spent years in All Japan before eventually joining NJPW. Here, it was about SANADA trying to prove that he is superior to his teammate. I highly recommend waiting for the post match promo. This was the latest in the highly acclaimed Tanahashi/Okada series. This played into so many of the themes from that series, in terms of familiarity and Tanahashi’s inability to beat Okada 1 on 1 since his last win in 2015. While familiarity with New Japan’s strongest rivalry in the last decade does add to the quality of this match, it is not required. This is still a tour de force of fantastic storytelling and drama with an incredible last five minutes. SANADA has had some great matches in the G1 this year. While he can adapt his style, his match quality is a little dependent on his opponent. So it’s a good thing that his last match was with Ishii. This was arguably SANADA’s best match, telling a story where both guys knew their opponents’ big moves so they had to use new tricks to gain the advantage. Like most Ishii matches, the finish was fantastic. This match was vital for Naito as he needed to win to keep his G1 hopes alive. Sabre was frustrated about being knocked out so his goal was to eliminate Naito out of spite. This was a great clash with Naito having to face a very motivated, very angry Sabre. These two worked well together, with Zack looking for any opportunity and Naito targeting the neck which seriously hampered Zack’s strategy at points. This was full of counters and even had a callback to Sabre’s match on night 1 of the G1. No matter how close they are, or how much they care about each other, first and foremost Omega & Ibushi are wrestlers. They both wanted to win this match and reach the G1 28 final. Initially they tried to rely on their skills and athleticism but when that wasn’t enough, the match started escalating. Towards the end it reached the rarely seen “friends trying to win by murdering each other” stage as they pulled out more and more crazy, high risk moves. 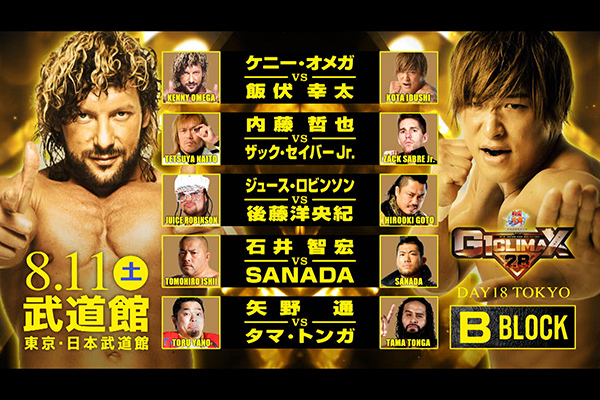 If you love high energy matches full of crazy moves, this will be one of your favorite matches in the G1. As good as it was though, they are capable of having a better match and I expect that match to happen at the Tokyo Dome one day. This was Rey Mysterio’s first New Japan match on Japanese soil. Sengoku Enbu is a tie-in to a video game that sponsored this years G1 Climax. Enbu seems to like doing a lot of hip attacks. This match was designed to build up Mysterio and it did a great job of that. Okada was constantly booed as he tried to bully Mysterio and it really built up the possibility of a future match between Okada and Mysterio. Firstly, I loved that Katsuyori Shibata was there as Tanahashi’s second. This was the longest ever G1 final but it didn’t drag at all. It built and built, with both men trying to rely on what got them this far. Ibushi had the advantage in terms of strikes and at some points his flurries were breathtaking. Tanahashi even had to channel some of Shibata’s attitude to try and fight through the pain. Tanahashi is one of the best ever at telling a great main event story and the crowd were firmly rooting for him. This was a great way to cap off a great G1 Climax 28. This year has been the biggest G1 in history, with the total live gate being over 90,000 people across 19 shows. The biggest story of G1 Climax 28 is Hiroshi Tanahashi winning his third G1. The Ace has already stated that he wants to main event Wrestle Kingdom 13, where he would challenge the IWGP Heavyweight Champion. However, he has also said that he needs to prove that he deserves the title shot, so he wants to defend it against Kazuchika Okada. This is a huge statement as Tanahashi last beat Okada one on one at Wrestle Kingdom in 2015. If Tanahashi can’t beat Okada then it will be the first time that someone has lost the Wrestle Kingdom title match contract since it became the prize for winning the G1. Of course, if Tanahashi can defeat Okada, then he has another huge challenge ahead of him: No one has successfully cashed in a G1 Climax Tokyo Dome title shot. Currently the Champion is Kenny Omega. Omega has already accepted a title match against Tomohiro Ishii, since Ishii defeated Omega in the G1. Kota Ibushi’s win against Omega means that he is also in line for a title shot. The question is, will he challenge his partner for the belt? In terms of Bullet Club, the Bullet Club OGs won the IWGP 6 Man titles from Bullet Club members The Young Bucks and Marty Scurll. Instead of celebrating, they threw down the belts. The war between the BCOG and both Bullet Club and New Japan management is not over. There is also the question of what Cody will do next as I can’t imagine that he’s enjoying being overshadowed by the BCOGs. Slightly surprisingly, we didn’t get any big moves or statements from Jay White. It’s obvious that he is trying to reshape CHAOS to his liking. After a strong début in the G1, where he finished third, White appears to be in a good position. Okada announced on the last day of the G1 that he is ending his managerial relationship with Gedo, feeling that he no longer needs a manager. I expect that the story of CHAOS being forced to choose between Okada and White will continue for months, possibly coming to a head at New Years Dash, the day after Wrestle Kingdom 13. Zack Sabre Jr prevented Naito from winning B Block and jumped up to third in the block. This now seems to have reignited this year’s feud between LIJ and Suzuki-gun, although Naito’s focus seems to be Sabre instead of Suzuki. Between the New Japan Cup and the G1 Climax, Sabre has had an incredible 2018 in New Japan. Aside from Omega, the only other Champions in the G1 lost six of their nine matches. Juice Robinson and Hirooki Goto both had poor showings compared to previous years. These set up possible title matches with a range of opponents. Sabre has been the most vocal about challenging for both titles. Robinson was pinned by Cody on the last night of the G1 and Robinson has announced that Cody will get a title shot. Robinson declared that Cody had jumped to the front of the line, just so that Juice can show that he has improved since he lost to Cody on the 2nd generation stars NJPW début 2 years ago. In terms of next year, the format will almost certainly still contain 2 blocks of 10. Injuries aside, I can’t see many significant changes to the line up. The most obvious would be YOSHI-HASHI, who was pinned on the last night by Taichi. Still, if the quality of next years G1 is simiar to this years then I’m looking forward to it.